Our 50 minute sightseeing tour of Portland Maine is different from anything else in the area. 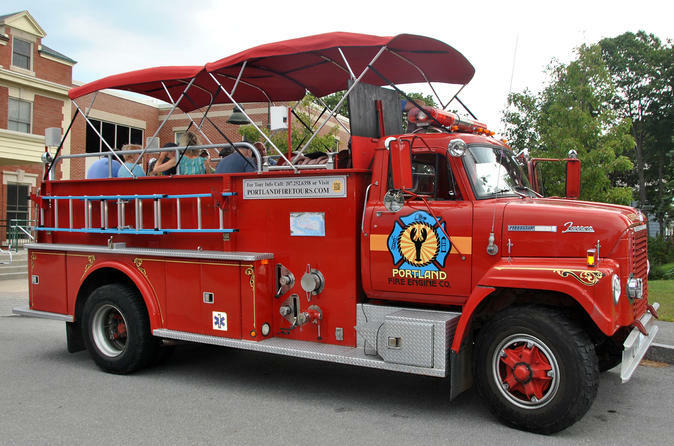 Come join our knowledgeable guide aboard a Vintage Fire Engine as you travel back in time and relive Portland’s past from a local’s perspective. Enjoy lighthouses, Civil War forts, fantastic views, interesting stories, and a multimedia experience with images from Maine’s history on the Fire Engine’s large flat screen TV. We are very unique sightseeing tour only offered in Portland Maine. Portland Fire Engine Co. operates a unique narrated sightseeing tour of Portland, Maine aboard a Vintage Fire Engine. We explore the peninsula of Portland and its many lighthouses and forts as well as the amazing architectural buildings hidden inside the cobble stoned streets that make up our wonderful city. The tour is a great way of reliving Portland’s past. Viewing the area while high up on the Fire Engine gives amazing views of Casco Bay as well as fantastic opportunities for photographs. The tours are approximately 50 minutes in length and are fully narrated by a very knowledgeable guide while displaying high resolution photographs from the Maine Historical Society via our on-board multimedia system, which includes a large flat LED TV. Tours require a minimum of 4 passengers to run, with a maximum of 13 people per Engine. Larger groups/parties will be split up allowing time for shopping, eating, or just exploring the Old Port.